Those crazy guys at Nintendo Life are at it again. 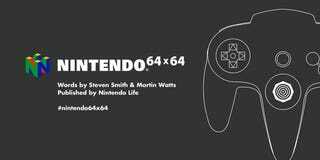 "Celebrating 64 Nintendo 64 games over 64 days in 64 words" seems like a perfect fit. If like me you were into the Nintendo 64 (I really need to catalogue my N64 game collection, it's one of the few that I actually own everything in perfect conditions, boxed and manuals included) feel free to drop in, read and even contribute your own memories from Nintendo's last Cartridge based home console. The feature begins today and of course there are no points for guessing which game got this train moving.